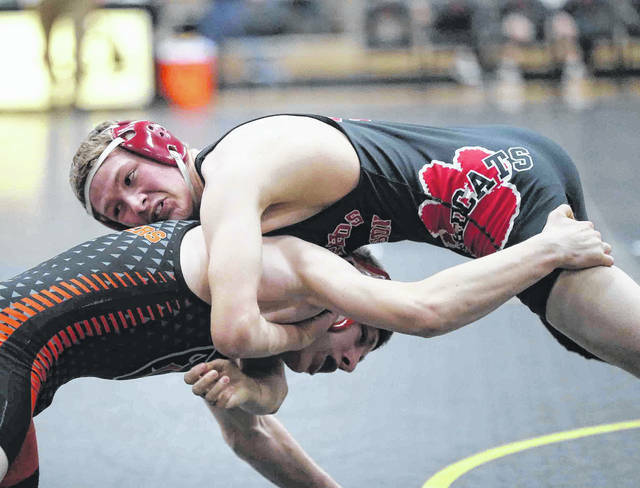 Allen East’s Jordan Kennedy, left, competes against LCC’s Gavin Caprella during Saturday’s Division III Region 24 Dual Team Tournament at Coldwater High School. 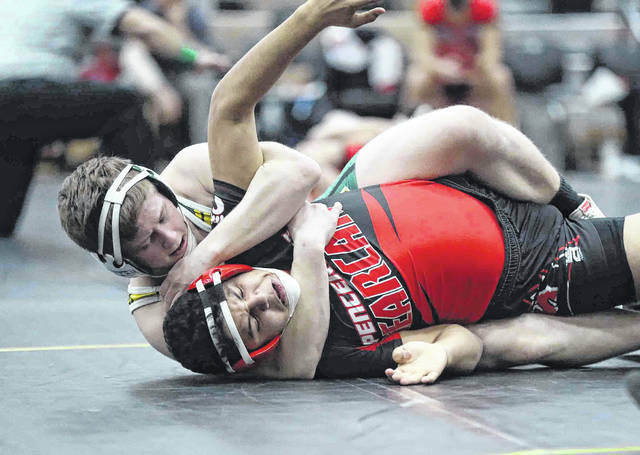 Spencerville’s Ruben Noriega, front, battles Troy Christian’s Craig Montgomery during Saturday’s Division III Region 24 Dual Team Tournament at Coldwater High School. Bluffton’s Taylor Kleman, top, competes against Columbus Grove’s Nicholas Wolverton during Saturday’s Division III Region 24 Dual Team Tournament at Coldwater High School. Delphos Jefferson’s Jonathon Brooks competes against Coldwater’s Grant Heuing during Saturday’s Division III Region 24 Dual Team Tournament at Coldwater High School. LCC’s Joey Caprella reaches for the leg of Allen East’s Balke Hershberger during Saturday’s Division III Region 24 Dual Team Tournament at Coldwater High School. Bluffton’s Dustin Mortimer, top, competes against Columbus Grove’s Joe Kohli during Saturday’s Division III Region 24 Dual Team Tournament at Coldwater High School. 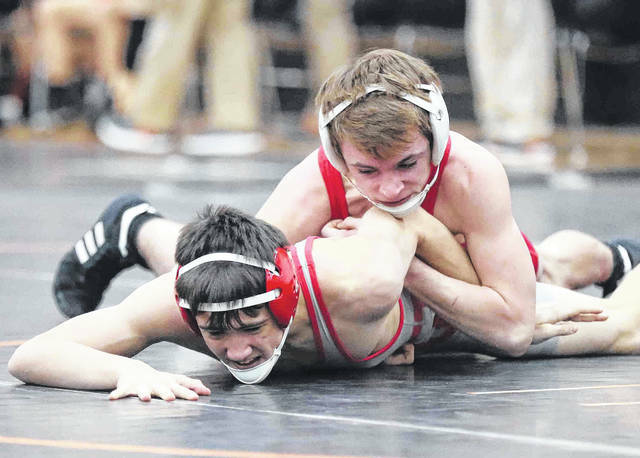 COLDWATER — High school wrestlers turn it up a notch in February. The conference tournaments are right around the corner and teams also are looking toward the postseason tournament. However, in between the conference meets and the postseason tournament, is yet another opportunity for these wrestlers. A total of 14 teams competed at Saturday’s Division III Region 24 Dual Team Tournament at Coldwater High School. From the field, one team emerged as the regional champion, earning a berth at the OHSAA Dual Team State Tournament at Ohio State’s St. John Arena on Sunday, Feb. 10. Then from March 7-9, the OHSAA Individual State Tournament will take place at the Jerome Schottenstein Center at Ohio State. The road for that postseason tournament will kick off Feb. 22 with the sectional tournaments. Versailles, the No. 1 seed at Saturday’s regional tournament at Coldwater, came away with the regional title, defeating Mechanicsburg in the finals, 39-29. Versailles will advance to the state tournament. A few area teams made it to at least the second round Saturday. Allen East won its first-round match against Lima Central Catholic, 53-24. However, the Mustangs fell to a strong Covington squad in the second round, 40-36 and was eliminated from the tournament. For Allen East, it’s all about getting prepared for the Northwest Conference Championships in two weeks. According to Abbey, some of the athletes to keep an eye on are returning state-qualifiers Drake Carmean (soph., 120) and Garrett Neth (jr., 195). Also, Brennan Davies (jr., 285), Jordan Kennedy (jr., 106) and Chase Miller (fr., 145) look to make some noise for the Mustangs in both the upcoming conference meet and postseason tournament. Bluffton also bowed out of Saturday’s tournament in the second round. Bluffton started the day defeating NWC-foe Columbus Grove 41-33. Then in the second round, Bluffton fell to the eventual champion Versailles, 56-17. Longtime Bluffton coach Jeff Kleman had mixed emotions on his team’s performance Saturday. “We still could have done better against Versailles,” Kleman said. “But I think sometimes, some of the kids get intimidated by schools that have really good programs. So, they go out there and aren’t quite where they need to be. “So, I told them that we need to tighten up some things, get back to work and get ready for conference. “Versailles, we haven’t seen at all this year. We knew they were coming here. We were hoping to get to the second round. We figured after the second round it was going to be tough. All we could do was go out there and see what happens,” Kleman said. Leading Bluffton is senior Deandre Nassar, who placed fourth in the 195-pound weight class at last year’s Division III state tournament. On Saturday, Nassar (29-0) breezed past his two opponents in the 182-pound weight class, recording a 21-7 major decision in his match against Columbus Grove’s Ezra Jones and then pinning Versailles’ Noah Gilmore in the first period. Nassar said it’s time to focus on the big picture. For Nassar, it’s about winning the NWC title – both as an individual and as a team – and then moving on to the postseason tournament. “It’s my senior year,” Nassar said. “I want to go out winning the conference as a team. I’ve won it three times (individually). This will be my fourth time if I win it again. It would be nice to get a team win, too. Coldwater went 2-1 Saturday, bowing out to Mechanicsburg in a semifinal, 42-31. Spencerville was defeated by Troy Christian in its first match, 53-12. Delphos Jefferson was ousted by Coldwater in the first round, 60-18. Parkway was knocked out in the opening round by Mechanicsburg, 57-21. ST. PARIS — As expected, state power Graham Local won the championship with a 75-0 victory against Napoleon in the finals. After receiving an opening round bye, Wapakoneta defeated Defiance 38-36 in the quarterfinals. The Redskins then fell 51-30 to Napoleon in the semifinals. In the opening round, Celina defeated Urbana 60-17, St. Marys topped Van Vert 60-18 and Kenton fell 65-15 to Bellefontaine. Celina then advanced to the semis with a 46-32 win against Bellefontaine and St. Marys dropped a 46-35 encounter to Napoleon. Celina’s day ended with a 70-3 loss to Graham Local in the semifinals. Going 2-0 on the day and winning all their matches by pin for Wapak were Colin Mellott (106), Luke Beach (145), Elyjah Roa (160) and Koleman Brown (182). Teammate Brenan Knueve (285) also won twice with a decision and a pin. Celina competitors recording two pins each included Landon Engle (120), Jaden King (138) and Ethan Ly (152). Noah Vogel of St. Marys (170) won a decision and recorded a pin. This entry was tagged alleneast, Bluffton, celina, coldwater, columbusgrove, delphosjefferson, limacentralcatholic, parkway, Spencerville, stmarys, Wapakoneta. Bookmark the permalink.